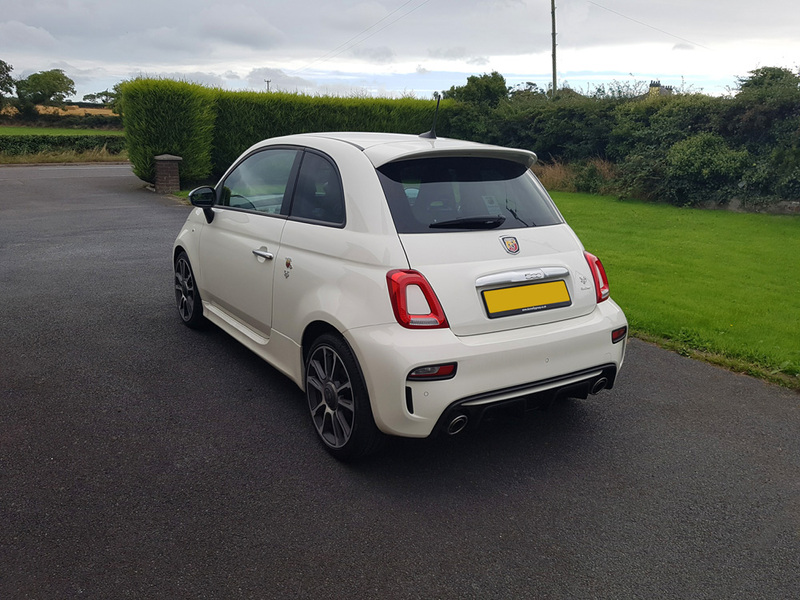 My wife is having her Fiat 500s serviced over the weekend and in the spirit of “If you don’t ask, you don’t get” they sorted us out with a 2016 Abarth 595 Turismo for a few days as a courtesy car. 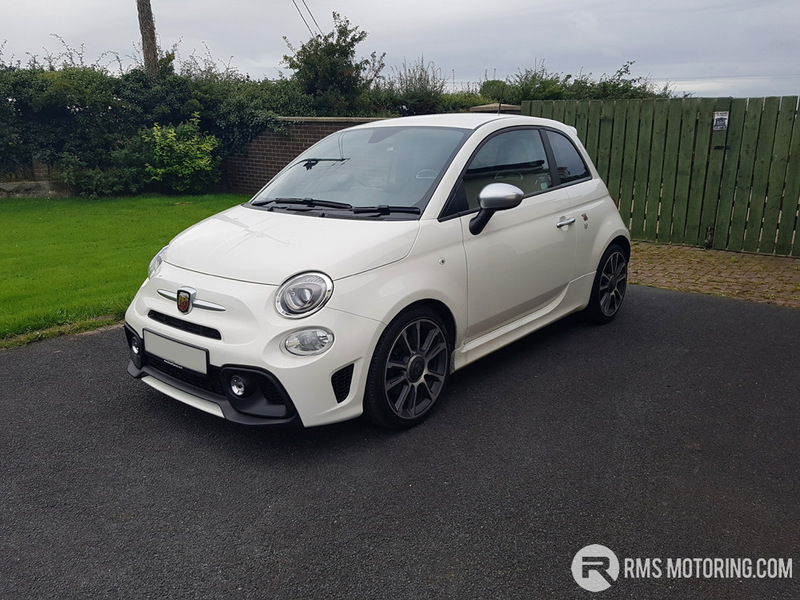 There are quick cars, there are cheap cars, there are fun cars and then there’s the 595. Man alive it is fun to drive. 165bhp in a tiny little shoe that pops and bangs on overrun cannot help but bring a smile to your face. 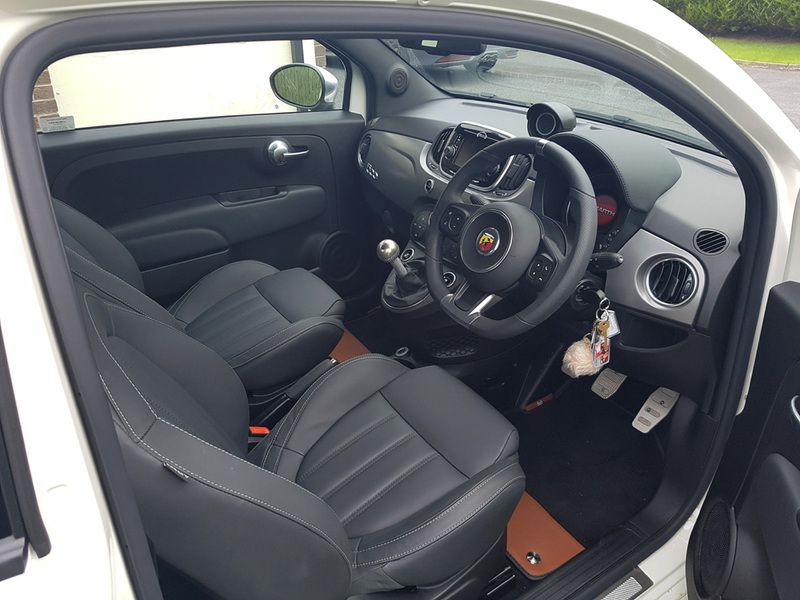 Don’t get me wrong, the driving position is still on rather than in and space in the back is severely limited (although with the seats down, you can get a mountain bike in there) and the ride is sometimes spine shatteringly stiff, it’s a bloody hoot to drive. Even the initial launch to 60, whilst taking 7 odd seconds, feels much quicker. But the noise, the noise is something to behold. A little car shouldn’t make this noise! And to the normal passer-by, this is a Fiat 500 making all this racket. Interior is excellent. Leather is standard in the Turismo, and also available in tan and red at no extra cost. Flat bottomed, chunky little steering wheel is a nice addition, pretty much standard across the range, our 500 has one. 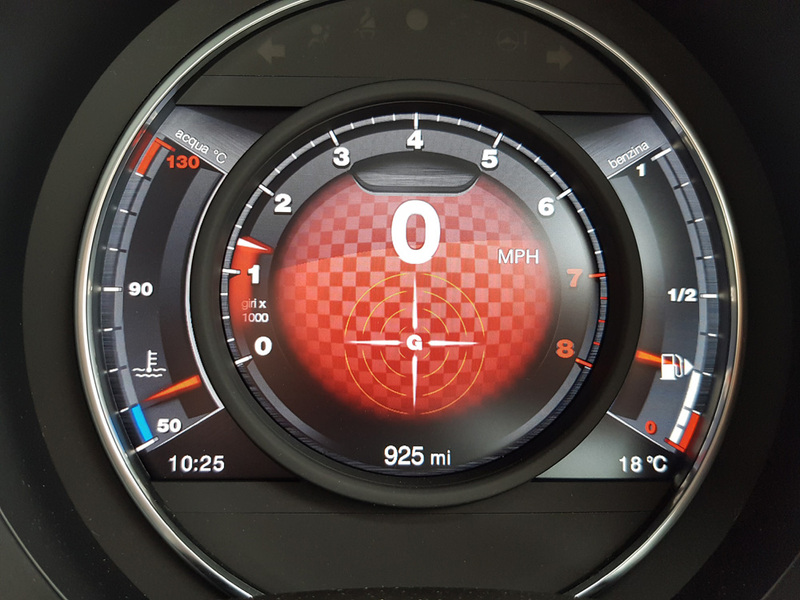 5″ touchscreen head unit is good, you can upgrade to include navigation or upgrade the whole thing to a 7″ unit. Even standard, it’s a damn sight better than the Blue & Me system in the older cars which is an old school dot matrix affair. G Meter included in the digital dash for those that like to show off until they hit a tree and a dash mounted boost gauge. If I’m honest, I thought this obscured the view a bit and was a bit of an afterthought. A pillar would be my pick of location. One particular thing I do like with the car is Sport mode. With most cars, you turn the car off, Sport mode goes off and you have to turn it back on. Not the 595, it’s on until you turn it off, and let’s be honest, why would you do that? Sadly it has to go back tonight and we’re back to the raw breakneck power of 69bhp but worse still, the wife isn’t as much of a fan as I am. There is an option to upgrade our lease into one today and she’s not interested. I urge you to go and drive one if you haven’t already, there’s something captivating about them. You will be trying to figure out how to get one into your life, as a second/third/fourth car. Have a long driveway? Get a 595! Large work carpark? Get a 595! Want something to drive once a week like a loon and laugh the whole time? Get a 595! So farewell little car, smiles per mile, you are right up there. Great read from a surprising source @Rocko! They really are the perfect sort of car for our roads and cities here. Nimble around town, easy parked, easy run and on the open road a barrel of laughs. I lifted a lowly sport version from a rental company about 18 months back and thoroughly enjoyed it despite it's lack of power. Perfect little car for zipping around in. Even the Seicento Sporting was a hoot and it only had what 60/65bhp? But that doesn't matter because on its skinny tyres with barely any sort of safety or protection it was was more than enough lol. There's folk that like luxury, there's ones that go for looks, status, lifestyle or outright power but for me something like this is what it's all about. It's as close to a hot hatch of the 80's as you'll ever get without all the hassle and you're guaranteed to have a laugh every time you take it a run. Nipping to the shop for a pint of milk very often turns into a 20 mile spin. 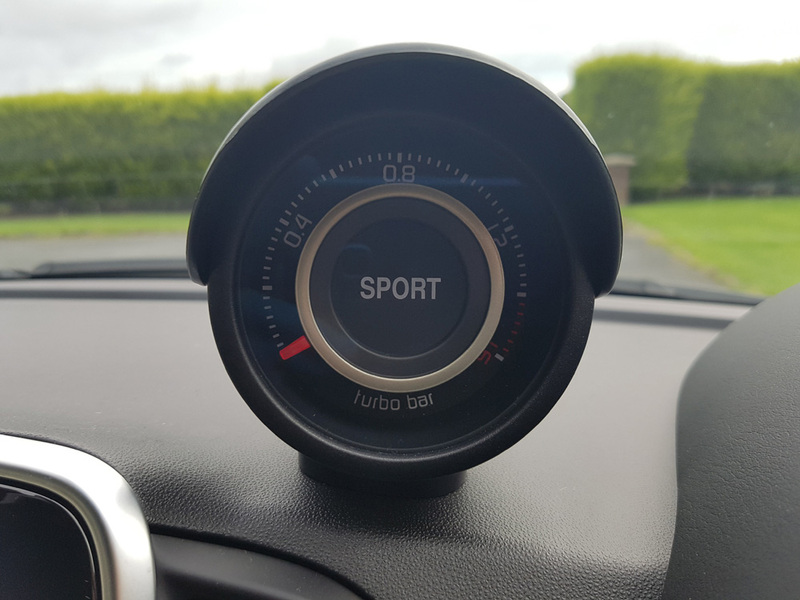 If you're on a budget and looking something that's equally (if not I dare say perhaps a little bit more) fun, try the supercharged mini cooper s.
Feck me your still going on about it :p Class wee cars tho. | If you're on a budget and looking something that's equally (if not I dare say perhaps a little bit more) fun, try the supercharged mini cooper s.
A JCW Mini was the downfall of the 595 in the Rocko household! Seen you pulling out of your driveway on Monday morning in it, you were a few cars behind me on the way into Bangor. Looked quite nice. | Seen you pulling out of your driveway on Monday morning in it, you were a few cars behind me on the way into Bangor. Looked quite nice. We were admiring your motor at the lights actually, it is lovely! Go and drive one. You'll struggle for a reason to give it back. I'm tempted to break something off our 500 just to get another go in it. @MichaelMc, you didn't read that. | Go and drive one. You'll struggle for a reason to give it back. I'm tempted to break something off our 500 just to get another go in it.